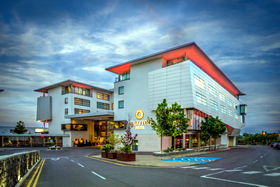 The contemporary and chic Four Star Clayton Hotel Galway is the perfect base for exploring the vibrant city of Galway, while enjoying all of the fam­ily fun activities that the West of Ireland has to offer. Located just over two hours driving distance from Dublin, and less than an hour and a half from Limerick, Galway has never been closer to get to for a family getaway. 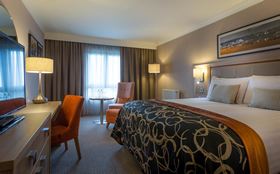 With 195 luxurious and spacious bed­rooms to choose from including double, twin, inter-connecting family rooms, executive suites and even a Presidential Suite the Clayton Galway offers something for everyone. Residents can also enjoy com­plimentary access to their Leisure Centre with a 20m Swimming Pool, Sauna, Steam Room and Fitness Suite in addition to the added bonus of free underground parking. The ethos at the Clayton Hotel Galway is ‘family fun’ and ‘creating lifelong family memo­ries’. On arrival each child is presented with a welcome pack, which includes details of the activities that families can partake in for the duration of their stay. With the family in mind this family friendly, professional ho­tel can organise a babysitter, high chairs, cots and extra beds for your family upon request. Why not treat the whole family this midterm or Easter to a family break to remember at Clayton Hotel Galway. Our family getaways includes two nights bed & breakfast with dinner on one evening together with a fun filled visit to the Galway Atlantaquaria. Children aged 4 – 12 years inclusive can enjoy complimentary access to our evening Meerkats Kids Club. With free parking, access to our 20m swimming pool, free WIFI and large family rooms Clayton Hotel Galway is the perfect base for your school holiday break. To top it off, for our Easter breaks children will also receive a complimentary Easter treat. You’re perfectly located at Clayton Hotel Galway near lots of fun activities suitable for all the family! Busy Bees – A fun activity centre ideal for babies and toddlers in their soft play areas or children up to twelve with bouncing castles, laser tag, slides and much more. Busy Bees is in Oranmore just a ten minute drive from the hotel. Galway Atlantaquaria – Ireland’s National Aquarium, Galway Atlantaquaria is in Salthill just outside Galway city. We offer family passes included in our family packages when you book direct! Turoe Pet Farm – A great day out with a petting farm and activity centre located just outside Loughrea in Galway. Perfect destination any time of year – take a stroll through the extensive nature walks around the grounds during the summer or if its rainy, the kids will love their Inflatable City! Wild Atlantic Way – As Clayton Hotel Galway is located to the east side of the city, you’re ideally located to escape to the Wild Atlantic Way during your stay. Visit the best of Galway’s beaches along the west or venture south to explore the Burren or the Cliffs of Moher, all within a ninety minute drive! Simply send us a message for assistance with planning your Fun Day out in Clayton Hotel Galway.